When I first heard Yanik Allwood’s voice I was pleasantly surprised. The first song on After Funk’s new album ‘Til The Sun Comes Up begins in semi-typical funk album fashion sporting a phat bass line, and dancing horn melody and as the song progresses I’m expecting more splendid regularity, but then this beautifully subtle soul voice comes out of nowhere and immediately captures my attention. This moment somewhat summarizes the feeling evoked by the band. After Funk creates funk music in a way that both harkens back to the greats and calls for motion into the future expertly navigating the familiar and new resulting in an intriguing voice in the funk idiom. Contrast is one of the most important aspects of any musical project. Anytime a musician repeats an idea for too long or fails to add different dynamic levels throughout their work they risk falling into the trap of the monotony. 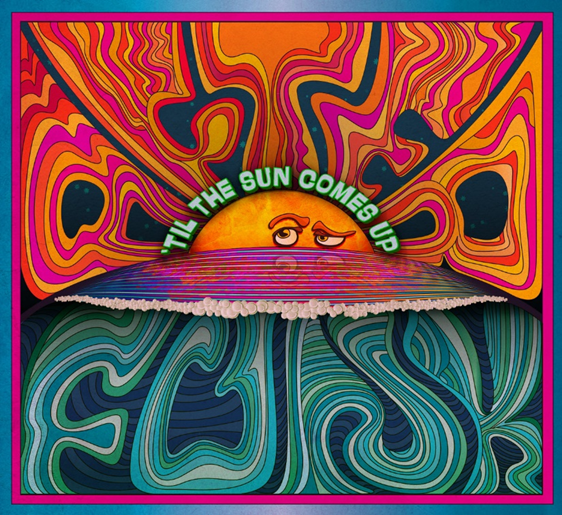 What makes ‘Til the Sun Comes Up special is not just the fun energy that After Funk brings into their grooves but also the variety of grooves presented. From the classic horn lines of Elephant Walk to the AC/DC guitar riffs of Rage & Chuff, it is clear that every song was carefully concocted with the consideration of variety in mind. The band also presents variety in their approach to dynamic levels and song development, which provides contrast on the individual song level. There is a clear moment towards the end of Elephant Walkthat sounds like the song’s peak, but the band continues its funky bass line at a much quieter volume level providing a stark contrast to the rest of the song. This attention to detail is part of how the band differentiates themselves from other ensembles in their genre. Fusion is an ever-present idea throughout the history of funk. Since its inception, Funk has always come with the implication that the improvisational qualities of jazz, hard hitting aspects of rock, and dancing characteristics of Motown would be present. One of the most important moments on Til the Sun Comes Up is the feature of Canadian hip hop artist Choclair on Catching Sunrise. Despite the more common appearance of rappers as featured artists in other genres, it is always exciting when a band has the ability to embrace different styles so naturally. The addition of Choclair also influences the way After Funkapproaches their sound on the rest of the album. The mellow bass line, rim shots, and muted trumpet provide another source of influence for the band clearly resulting in a more specified ensemble sound throughout the album. The promise of a fantastic live performance is ever-present in the funk genre. A good groove can make anyone dance, however, sometimes this fact sacrifices basic compositional techniques. After Funk navigates a vast selection of influences ranging from hip-hop to soul to good old fashioned rock n roll resulting in an interesting, unique sound all without sacrificing basic ideas crucial to good songwriting. This entry was posted in Reviews and tagged After Funk, Canada, Fun, funk, Till the Sun Comes Up, Toronto on November 20, 2015 by librarian.